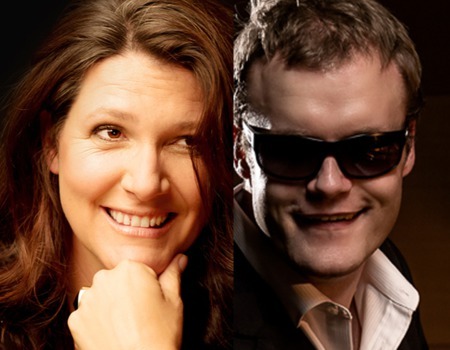 Internationally acclaimed singer and storyteller Kate Dimbleby joins forces with the virtuosic talent that is Derek Paravacini for LIFE AND ALL ITS UPS AND DOWNS, an evening of unplanned fun, spontaneous song and unforgettable stories. Expect a return to the classic songs of Cole Porter, Irving Berlin and Noel Coward, as well as songs from the unique era of 70s songwriting. In the USA, Derek has been dubbed "The Human iPod" for his encyclopedic knowledge of tens of thousands of pieces of music - all learnt by ear. But more than that, he is a fiery, creative musician whose astonishing improvisations and dazzling technique have wowed audiences all over the world. He has scored over a million hits on YouTube and another million on his renowned TED talk blog, where he speaks about his unique journey as a musician who was born blind, autistic and with severe learning difficulties. Kate, who has released five albums and performed her cabaret shows all over the world, has recently returned from her three week off-Broadway debut of her show about 70s songwriter Dory Previn.